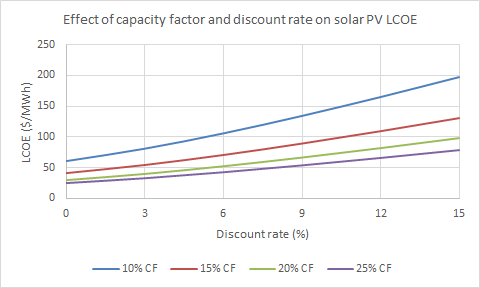 In the current policy environment many energy technologies can appear attractive with the right set of assumptions: discounted clean energy technologies (wind, solar and nuclear) where the discount rate is heavily influenced by risk (see graph) and, perhaps surprisingly, new load-following fossil fuel plants (especially natural gas) where continued wind/solar technology forcing actually provides substantial upside potential. 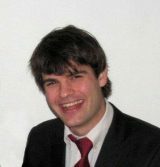 CCS researcher Schalk Cloete looks at the different technologies and highlights how risk can come from any factor that could unexpectedly increase the cost and/or reduce the revenue relative to the assumptions employed in the levelized cost calculation. 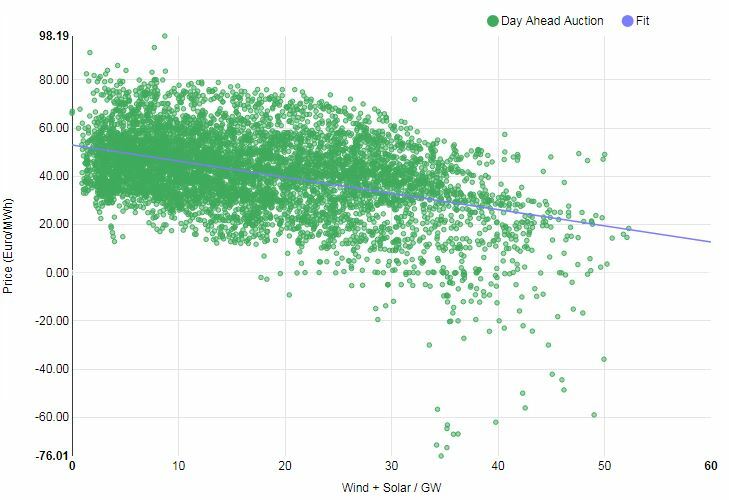 As wind and solar market share increases, this effect magnifies, causing the average value of all wind and solar in the system to fall. If wind and solar market share continues to increase by about 1% per year, the value of electricity produced by today’s plants will drop by half by the end of their lifetimes. Direct exposure to this natural market dynamic is a major risk for wind and solar generators. In parallel, two significant costs will also continue to increase with further wind and solar deployment. The first is grid integration costs, which is related to grid congestion and imperfect forecasting. 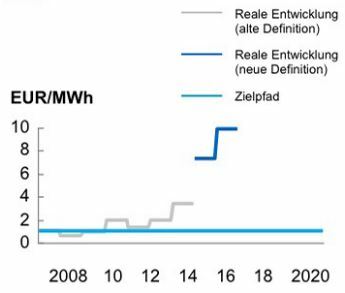 This cost is already highly significant (€10/MWh) in Germany. Long distance transmission costs about $2/kW/km and can face large additional cost inflation from public resistance. As wind and solar market share expands, more of these lines will need to be installed to avoid grid congestion, which causes most of the grid integration costs mentioned above (largely in the form of redispatch and curtailment). As a rough quantification of grid expansion costs, a grid connection transporting wind power 500 km to a distant demand centre will add about $1000/kW to the wind installation cost (over $2000/kW if public resistance forces lines underground) – a very large increase. 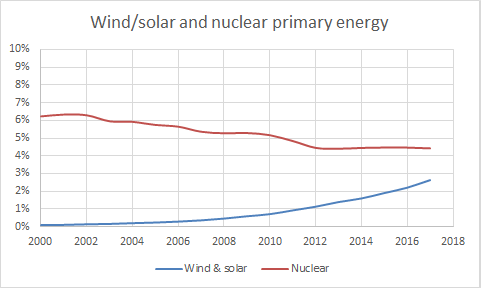 Technology-forcing of wind and solar power beyond a certain point will also start to reduce the capacity factor of nuclear plants. If the combined output of wind, solar and nuclear exceeds total demand, nuclear plants will have to ramp down. Due to the high capital costs of nuclear plants, such capital under-utilization will have a significant negative effect on economics. This negative effect will be partially balanced out by an increase in average value of the sold electricity (wind and solar will only displace nuclear at the lowest price point), but the overall effect will still be negative. For new load-following fossil fuel plants, continued wind/solar technology-forcing is actually a good thing. As shown below, dispatchable plants produce their highest output during times of high prices (when wind/solar output is low). Larger electricity price fluctuations caused by increased wind/solar market share is therefore positive for profitability. 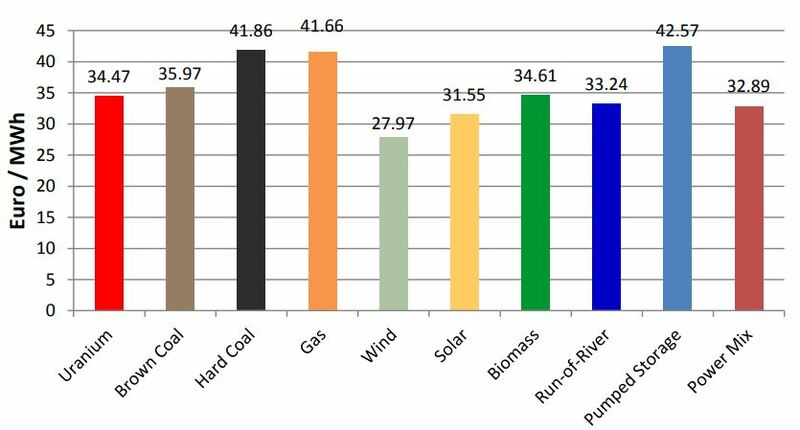 As shown below, the average unit of load-following hard coal and gas power was already 50% more valuable than the average unit of wind power in Germany over 2017. This large difference will only continue to grow in the future. Capacity factors of new load-following coal and gas plants should not be greatly affected by further increases in wind and solar market share. Continued wind/solar technology-forcing will gradually displace baseload nuclear and coal plants, but load-following plants will remain critical for supply security for decades to come because of the low capacity value of wind and solar. Another risk-mitigating factor for thermal power plants is the fuel price dynamic that will play out when fossil fuel demand finally plateaus and eventually starts falling. As soon as fossil fuel demand starts declining due to high CO2 taxes, fuel prices will drop precipitously. In a declining market, the need for new investments will dwindle, leaving only the operating costs to extract fossil fuels from existing fields and mines. From the point of view of a power plant, this dynamic will cancel out a sizable portion of the added cost of the high CO2 taxes responsible for the fossil fuel peak. CCS retrofits look particularly attractive in this scenario since it will capture the benefits of lower fuel costs while avoiding most of the high CO2 costs that caused the fuel cost decline. Natural gas plants stand to benefit most from these trends. Compared to coal plants, natural gas plants have lower CO2 intensity, more to gain from fuel price declines after the fossil fuel peak, and greater flexibility to capitalize on increasing electricity price volatility caused by wind and solar. Natural gas supply security presents an important risk in some countries, but this is something the industry has decades of experience with. From this qualitative analysis, nuclear appears to be the riskiest investment whilst load-following fossil fuel plants (especially natural gas) appear to be the safest. This will remain the case as long as wind/solar technology-forcing policies stay strong. 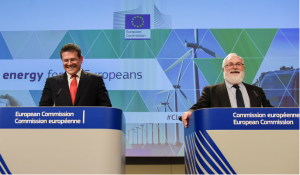 However, these technology-forcing policies which not only include direct subsidies but also indirect incentives such as artificially low financing costs, no accountability for value declines and cost increases caused by intermittency, cannot last forever and when they fall away, wind and solar investment risk will increase substantially, while nuclear risk will decline. Under current conditions load-following fossil fuel plants will continue to benefit being hedged as they are against the unlikely (but very necessary) scenario of rapid CO2 price hikes by the possibility of CCS retrofits. This underlying CO2 factor will stay in play until fossil fuel demand eventually peaks. In the developing world, where the majority of future energy infrastructure will be built, a wide array of other economically enabling infrastructure is also required, including housing, roads, schools, hospitals, factories and commercial districts. It is crucial that investment is directed to the infrastructure that can deliver the fastest payback time to drive further economic growth. This can only be ensured by imposing a high discount rate, well in excess of the real economic growth rate. All-in-all, the discount rate applicable to a developing nation should be around 10% plus a sizable risk premium. 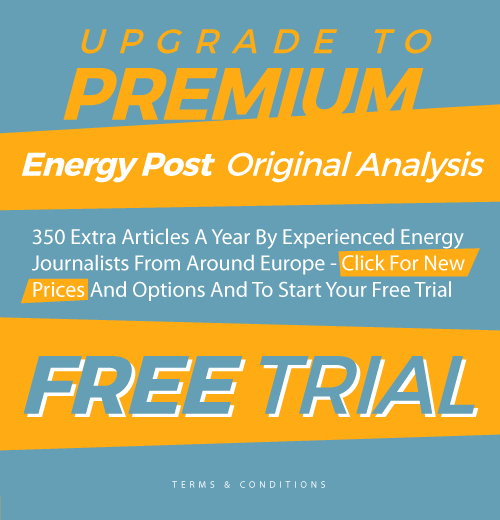 The absence of battery storage in this analysis is a glaring omission at a time when costs are declining rapidly to the point where they are challenging gas peakers. The author’s enthusiasm for nuclear seems to blind him to the recent, but well forecast developments in this area. Battery Storage can only help to shift generation through time. Fact is, aging generation capacity needs to be replaced and Nuclear is the best option if you want to meet climate goals. I have hope that the new generation of modular reactors being developed will in time help turn public opinion in Germany. a) the cost for intermittency is also not carried by nuclear and fossil fuel plants, which often have a highly intermittent power production (->belgium, Switzerland, france). So it remains unclear why only wind and solar should carry this kind of cost. The value decline of wind power for example is shrinking in germany over time. in 2018 about 28GW of wind power production resulted in a 50% sales price decline, while in 2012 this already happened at a power generation of 20GW. All kinds of power generaton face this decline of sales prices. This limits the market shares for nuclear and lignite plants in the same way as it does for wind and solar. The stopped the expansion of french nuclear at some point. Helmut, new conventional plants are not intermittent, to the same extent as wind/solar, once bedded in. Forced/unplanned outage rates increase towards the end of a plants life, that applies to wind farms too. You need to compare fleet data for plants that are not towards end of life, and not cherry pick data. Anyway, it’s been demonstrated many times that conventional plants do not suffer from intermittency to anywhere near the degree that renewables do. Market shares are limited by demand. Now that FITs have largely ended developers will not risk investing in a potentially over supplied market. Conventional plants are itermittend. They fail, and then from one second to the other fall from the expected output to zero. This itermittend, and intermittend on a relevant level, see e.g swizerland where the nuclear fleet did only consume power for months and months, and now belgium where the nuclear fleet drops to around 20% of the expected output for a longer time. Both was NOT planned this way when the fleets were designed. And both cases need a backup for 100% of the nuclear capacity standby somewhere. Wind and solar are variable. Due to the small sice of the singel unit, the local failures which mae the single unit intermieend does not show up in the output of the fleet. Statistics of big numbers. VBut the local output is variable. So the power to which the systems can ramp up their output is not constant but changes with weather patterns – but in a predictable way. In the range of hours the output of the german solar or wind fleet is more reliable than the output of the nuclear or coal fleet. In the range of days or longer this is the other way round naturally. Also when wind and solar ar not looked at locally, but dhe summarised output over large regions, the variability is shrinking. This makes a big difference in the management of grids. Conventional plants need a certain amount of hot standby generation in the grid which can instantly take over the load of failing plants. This is ot neccesary to this amount for wind and solar. Demand for this kind of reserve is falling in germany because of this. Diesel generators e.g. cost around 150€/kWh for cold standby capacity. Hot standby capacity from a new coal plant costs, according Lazard 3000€/kW. So weather conventioal plants need 3GW hot standby from a new coal power plant as reserve for intermittency, or wind and solar need 60GW of new diesel emergency generation as backup for extreme cases of variability does not matter in cost in this calculation example. Just that the Diesel generators can be used to brovide UPS service to all relevant infrastructure and manufacturing in parallel as a benefit, while the hot standby plant can only do a bit grid services (whoch batteries can provide now at very low costs). But there are still a lot of people around which calculate the backup against variability of wind and solar with the high prices of backup against intermittency of conventional plants. Ignoring the huge differences between both kinds of backup. It is irritating that Germany is cited so often but not all data is taken into account. The data in the article is from http://www.energy-charts.de they have a presentation that shows the market values of the different power sources in comparison. There we can see that the theretical graph in the beginning is plain wrong. With 7% solar and 20% wind the values are not 75% and 95% but 92% and 82%. And solar can be used behind the meter. So a high solar share is possible because power is more expensive behind the meter. And as mentionet before: all kind of storage and load management? For storage and load management: don’t forget electric cars ind any risk assesment! And where is biomass ? In Germany there is as much biomass as solar electricity generation. That being said: nuclear is indeed the riskiest investement. For one the time horizon is very long (approx. 50 years) which by itself is a big risk. 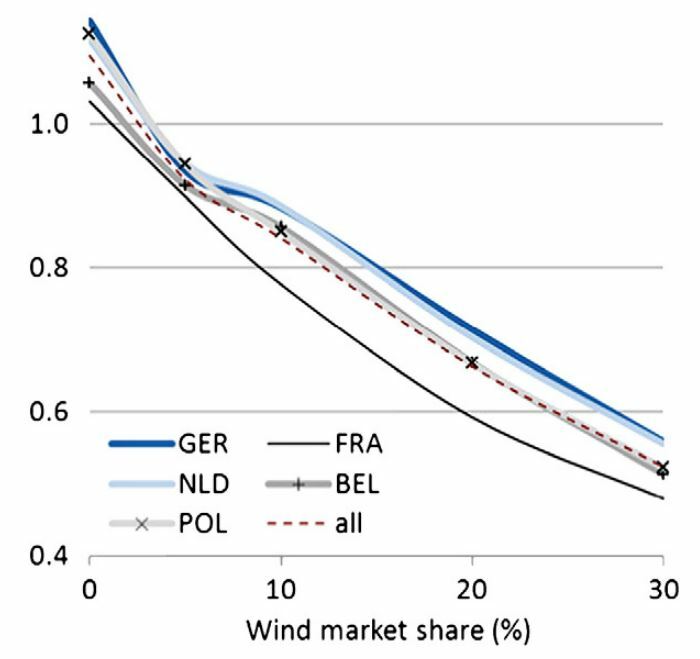 The difference with the observed market value factors is primarily attributable to the fact that Germany liberally uses the grids of its neighbours with much lower wind/solar share as a balancing mechanism. The 19% wind in Germany in 2017 is actually more like 15% wind in Germany and its closest neighbours. In this case, the model projection is quite accurate. I quantified the correlation of wind/solar power with exports some years ago: https://www.energycentral.com/c/ec/effect-intermittent-renewables-electricity-prices-germany. Visual inspection of the current trends suggests that the situation is similar today. I am writing several articles to quantify the risks discussed in this article. The potential of battery storage to mitigate the solar risk will be quantified in due time. In my opinion, BEVs have limited synergies with wind/solar demand-response for practicality and cost reasons: https://www.energycentral.com/c/ec/celebrity-couple-intermittent-renewables-and-electric-cars. Having to charge most vehicles in the middle of the day will be inconvenient and expensive. The closest neighbourls, like e.g. Danmark which is the next neighbour to german wind power generation, also have their own wind power generation with even higher share of sind in the grid. Exprts are mainly nuclear and inflexible combined generation and old lignite blocks. Which make the grid behave as if the load is constantly X GW smaller in Germany. (with 20GW inflexible generation the grid behaves as if ther would be 24% wind and not 19% wind in the grid – so much about the model…) With these systems either getting retrofits to become flexible, and 10GW nuclear leaving in the next years, the amout of wind in the grid which lead to the same market reaction rises. I have shown this in a previos comment, and this process will go on. Power exchange with neighbouring grids is also an wanted effect – it excahnges power between regions with high wind and regions with low wind. France does the same with it’s surplus nuclear, just that the power always is exported at low demand times (nicht, summer) in the neighbouring countries, while wind exports usually meet low wind generation in one or more directions in some distance which attract then the exported power. Charging in the middle of the day – does not cost very much if a 400V 11kW Plug or less is enough. With 20-40km dayly travel distance, and 20kWh/100km upper limit of consuption, we talk about 8kWh whoch a car would load every day at noon. So a 230V 3,5kW Stadard plug is enough at work. So we talk about 100€ or less per car parking at work on company ground (free power or simplified calculated power, or standard equipment in high numbers). I think such imvestments will simply be done when the next renovation happens at the parking space. 1. Click on the green and yellow circles above the graph to deactivate wind and solar. See how conventional generation is negatively correlated with exports (more generation = less export), invalidating the idea that it is conventional sources being exported. 2. Now click back on wind and solar and click off the grey circle for conventional generators. The strong correlation between wind/solar generation and exports is immediately evident, showing that these sources are driving exports. 3. Now imagine what would happen if Germany’s neighbours also installed a lot of wind and solar close to the German border generating at about the same time as the German wind/solar generators. Obviously, the amount of exported power would fall strongly. 4. You can also see the inverse correlation between value and wind/solar output on the graph. Now imagine what would happen to prices if the added demand created by exports during times of high wind/solar was much smaller. Obviously, wind/solar value would be much less. Denmark is not a general benchmark for wind/solar integration. Its power market is tiny (less than 5% of Germany) and its high wind share is balanced by Norwegian and Swedish hydropower (a unique situation). 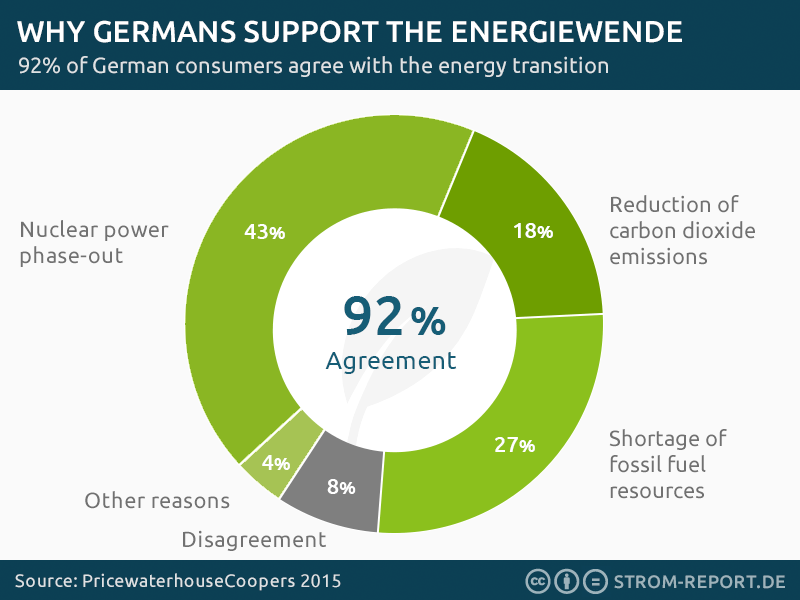 Power trade between Germany and Denmark is a small fraction of the German total. 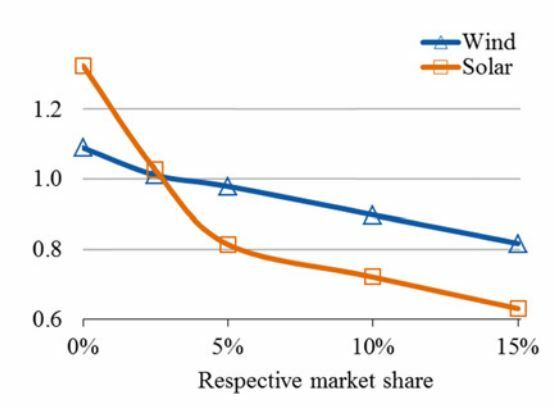 Using BP data, the weighted average wind/solar market share of Germany’s trading partners was 3x less than that of Germany in 2017. Obviously, it will be good for wind/solar value factors if Europe retires all nuclear and coal and runs all backup plants on Russian natural gas. The drawbacks of this strategy are equally obvious. The model results cited in this article assume a balanced dispatchable generator fleet without the large costs associated with early retirement of perfectly functional generators and the economic and energy security implications of a high natural gas import dependence. – randome import / export causing a varianz (sigma²) of roughly 3GW on this, caused by load, wind and solar. Many ignore the first part and see only the second one. take the part prices, take oint diagrams for prices, take residual load. 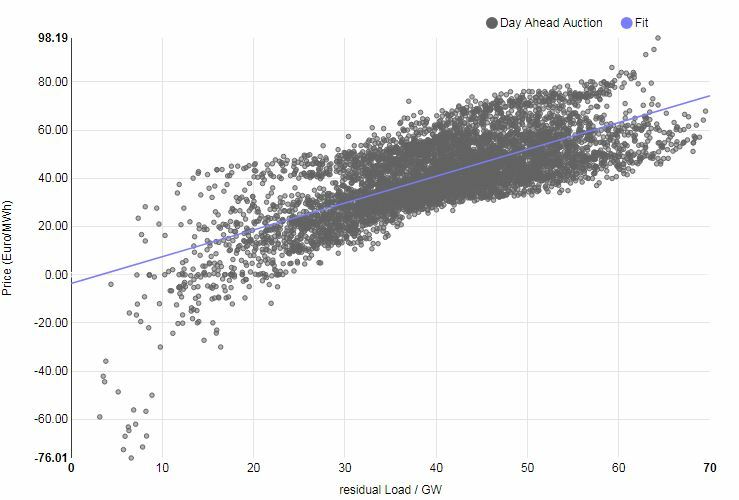 Find that a price of zero happens almst exactly at zero load for the linear approximation, and find that negative prices happen below 10GW residual load, which is actualy the output of nuclear + inflexible combined generation + a bit inflexible lignite. 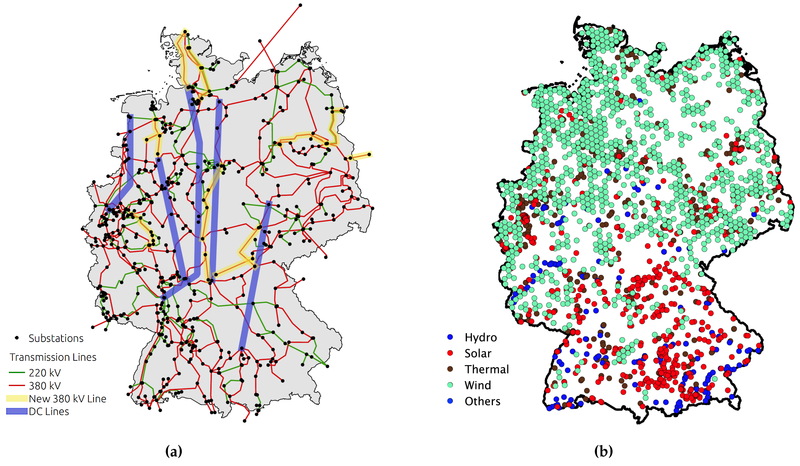 Third exercise: imagine the interal grid expansions in germany, adding more than 10GW north south capacity is added, and allow to transport another 10GW from wind generation in the north to consumption in the south, reducing conventional generation in the same amount in the south. This would naturally reduce wind power exorts in the north of germany to the east and west accordingly. which would easily compensate less exports due to a lot of wind power generation directly behind the german border. Danmark is such a example of even higher wind power share than germany directly behind the border. So the effect of exports allowing higher maket shares in a local market like germany is compensated by grid limitations not allowing to utilise the whole market flexibility inside the market today along with neighbours wanting to export power during times of high wind due to eve higher shares of wind in their local market (Danmark) A rough estimation shows that both effects should balance each other more or less. As soon as neighbours not linked to germany in the north are connected to the wind power generation in the north of germany, thi picture changes drastically. South of the german border the corellation with the wind power generation in the north is falling fast especially after passing the Alps. Which means that the likelyhood is small that these areas in Italy, southern Frace/spain, Balkan etc. want to export wind power at the same time, they are more likely to be interested in importing wind power at that time. Which allows higher shares of wind in the grid due to the uncorrelated generation in the huger area. Which explains why Entsoe comes to the result that 100% renewables are possible in europe with a acceptable amount of grid expansions. I think entsoe ad the underlying utilities have a slight idea about power generation and grid operation. Do you agree to this? I do not see a need for russian gas for backup. First the amount of balancing in a european grid is much much smaller than when only looking at the geographically small german grid. Second there are around 150TWh of storage capacity of existing hydropower which can be utilised to fill gaps. Especially if more turbines are connected to the existing reservoirs. This is not economical today due to the low share of renewables in the european grid, and the huge existing conventiolal fleet with significant surplus capacity. But especially with some carbon price it will be cheaper to add hydro turbines than open cycle gas turbines to add capacity – energy storage is available in abundance already. Similar for biomass. Gas storage is possible at acceptable cost, or just exisitng. Biomass producing gas produces mainly (useless) baseload today, while the engines are able to ramp up and down fast. Making tis generation more flexible is under way, but not yet there. This allows another roughly 500TWh of power to be trown in remaiing gaps in wind and solar power generation. With a reasonable CO2 price those options, along with trading power wich north africa and other places will happen before rssian gas is consumed. Look at the german power market. With 40% renewable share, the amput of power comming from gas is falling significant this year, not rising. as it should according to the “more renewables mean more dependence on russian gas” theory. I admire your belief that ‘Russian gas will not be needed for backup’. However just look at the bigger picture in Germany now. Earlier this year Gazprom announced its latest export figures – and one number was of particular interest. The company revealed that Russia’s natural gas exports to Germany increased 12.2% (3.5 billion cubic metres – bcm) in the first half of 2018, compared to the first half of last year. That’s just this year. Expect that to rise further with future lignite and nuclear closures. Renewables and grid expansions alone cannot replace this conventional capacity, it’s inevitable that Germany will need much more gas in power generation. Also the level of major transmission expansions needed for renewables is not just costly but environmentally very problematic, subject to extended delays and significant cost escalation for undergrounding. With Russia stomping around Ukraine and seizing Ukrainian naval vessels, Germany should be turning off Russian gas supplies altogether. 1. 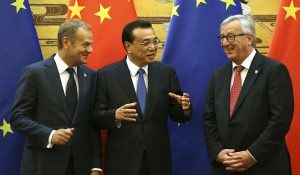 The most severe is the total lack of any new technology development and deployment in the future, such as battery-storage or methanisation plants for renewable energy as well as an occurring sector coupling (heat and transport) to utilize the times of relatively cheap electricity thanks to growing renewable electricity supply. This will of course greatly stabilize the value of renewable electricity instead of the decline the author predicts. 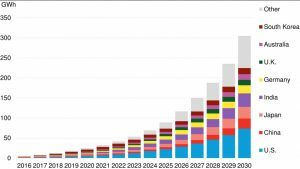 The cost decline in battery storage and other storage technologies will also make the flexible fossil plants touted here only make a short term solution for grid stabilisation until they get priced out of the electricity market very soon as well. 2. Carbon Capture and Storage (CCS) for Fossil Fuel plants has proven to be way too expensive as to ever compete with the ever delining cost curve of renewables plus storage, so it already very clear that it will and can play no role to make Fossil Fuel plants competitive again. 3. The use of primary energy as a category greatly inflates the importance of fossil fuels and nuclear plants due to their great inefficiency of converting this primary energy into usefull end energy. As the end energy is that what matters, this category should only be used to highlight the extremely wasteful and therefore expensive nature of fossil fuel and nuclear plants and not for estimating the amount of energy that would have to be substituted by renewables and storage, since two thirds of primary energy from fossil and nuclear plants are wasted and don’t have to be substituted since they will be gone as well without anyone missing these two thirds, when fossil and nuclear plants will have been shut down. Because of the importance of these omitted points, I think that this article holds very little value for the assessment of future energy markets imho. I do agree however that nuclear energy is an extremely risky investment because it cannot compete on cost, but I do not see this to change ever again due to the great advances the renewable and storage technology sectors continue to make. For point 1, the effect of battery storage will be quantified in a future article. Methanization will require wind and solar to be sold at extremely low prices to even approach affordability. The further big challenge is the low capacity utilization of such a plant. This is OK if subsidies ensure low financing costs, but if any reasonable discount rate is used, such a low utilization factor quickly ruins the economics. Using electricity directly for heat in the industrial sector will only be economic if the electricity is extremely cheap (i.e. wind/solar market value is very low). And again, this will only be possible for a relatively small fraction of operating hours, bringing serious capacity utilization concerns. See my comment above about the lack of synergy with BEVs. 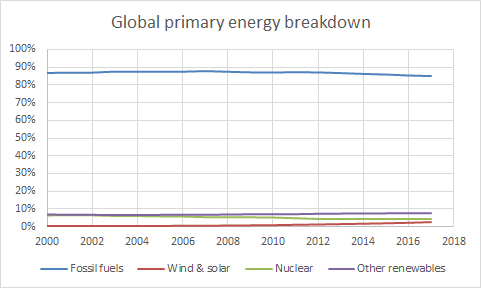 For point 3, as explained in the figure caption of the primary energy graph, the wind/solar share is already inflated by almost a factor of three to account for thermal power plant inefficiency. If you want to express it as final energy, wind and solar power currently stand at about 8% of electricity, which is about 18% of final energy. 8% of 18% is a tiny 1.4% of global final energy consumption. I gave a breakdown of current final energy consumption in this article: https://www.energycentral.com/c/ec/celebrity-couple-intermittent-renewables-and-electric-cars. To assess the benefit of V1G, the authors benchmark against high capital costs of NaS batteries ($426/kWh). I’m sure that, if low-cost batteries would have benefitted their conclusions, they would have selected Li-ion technology with optimistic future cost reduction assumptions, reaching about $200/kWh. Such cheap batteries are critical to ensure that the subsidization cost of putting all of these BEVs on the road does not become ridiculous (BEVs sold in California today get a subsidy of about $15000 per vehicle including federal and state subsidies, ZEV credits and zero fuel taxes). If we use this more reasonable benchmark, the V1G benefit reduces to $0.75 billion. To calculate the V1G costs, the authors assume that only $100 per charger is required to upgrade to smart chargers. But this is the wrong benchmark. If everyone drives 72 kWh BEVs (as assumed to be the 2025 number in the study), very few public chargers would be required. Commuters could simply charge up at home once every few days and stop at a DC fast charger once in a while for longer journeys. The benchmark scenario should therefore be one with a million fewer public chargers. Public chargers cost anywhere from $2000 to $7000, depending mainly on the difficulties of establishing a grid connection. If we take $4000, this is an added $4 billion cost to the V1G strategy, already dwarfing the $0.75 billion benefit. Then we also have the neglected factor that V1G of commuter cars will increase the peak load of commercial districts, probably adding a few billion in distribution grid upgrades. V2G has never made sense to me. 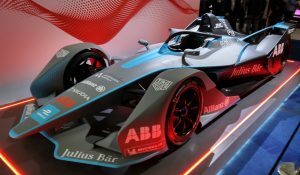 Batteries degrade with use, so why would you increase the degradation rate of BEV batteries (that increase depreciation of the entire car), when you can install specialized grid-scale storage that is designed for this purpose and does not involve added costs to maximize energy density and collision safety? In addition, V2G will require people to plug and unplug their cars everywhere they stop. This can easily end up with 5 minutes of extra effort every workday. At $20/hour, this time is valued at $5 billion over 10 years for the 1.5 billion people assumed in the study. Another practical aspect is that mitigating the duck curve will require people to drive home in the BEVs and then plug them in to be discharged to mitigate the evening ramp and peak. This means that they will start the next day with a relatively low charge. This can be very alloying if you forgot that you had a long trip planned for today. In summary, California will have to pay people a lot of money to participate in mass in V2G schemes that will increase the depreciation rate of their cars, create significant extra effort with plugging in everywhere and substantial inconvenience whenever the driving pattern is not totally standardized. I’m sure there will be plenty of other solutions that can do the job much more cheaply. Two final rather fundamental points. First, getting this lovely match between BEVs and solar requires lots of subsidies. 1.5 million EVs subsidized at $10000 per vehicle costs $15 billion. 50 TWh/year of solar at a LCOE of $60/MWh displacing only natural gas fuel cost at $20/MWh costs a further $20 billion over 10 years. This puts the $1 billion benefit for V1G in the study into perspective. Second, V1G and V2G rely heavily on single-person-in-car commuting, which is terribly economically inefficient. Trends like telecommuting, car-free city zones and autonomous vehicles can save about $10000/person/year (https://www.energycentral.com/c/ec/future-personal-mobility-visions-part-1-car-free-lifestyles), which have some orders of magnitude greater economic potential than the numbers we are talking about here. A commitment to V2G is a commitment to perpetuating the great economic inefficiency of single-person-in-car urban transport. Well I do not agree with the opinion that cars will not be plugged in when parking in commercial areas. I tink they will have a connection, although it might not be very strong for each single car. Local grids can carry multiple times the load of the whole grid, because they are not controlled today and are dimensioned for the worst possile peak in the future decades usually. If cars charge smart it is a nobrainer to include the load of the local transformer in the equation (to measure it is cheap, and commuicating and processing this data is cheap today, too. ) So why should someone upgrade grids where usually 90% of the capacity, and in worse case 50% of the capacity lay idle? Ther might be some cases where spare capacity is just 10% or even zero % for a few hours of the year, but then maybee these few cars connected there can not be charged at that time, but only a few hours later – if the power does not come from locally collected solar on the building and it’s parking lots. Such cases must be considered in the system design, but do not dominate system costs. But I agree with the second part of the text. EV batteries are not the silver bulliet, they are another tool in the big toolbox available to deal with variable power generation of wind and solar. This toolbox is getting bigger and bigger every year. So lets use the tool best suitable in each case. We will see better which tool it is when it is time to really use it. At the moment grid expansions are often the lowest cost option. This might – or might not – change over time. France operates a fleet of reactors, the capital costs of construction having been written down for the older plants. Also the economics of operating a fleet of 58 reactors is different to that seen by an owner of one reactor. For over ten years now new UK gas fired plants have had to demonstrate at the planning and consents stage that they could be retrofitted with CCS assuming the the technology becomes feasible. Although demo. 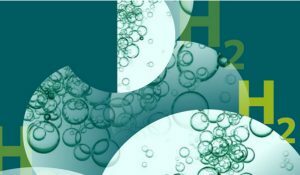 CCS plants exist around the world, being able to bury enough carbon is far from having been proved feasible. Sure, capital under-utilization is not so bad if the capital is already paid off, but we are talking about new plants here. Capital under-utilization will increase the payback time of new nuclear in a time when the future of nuclear is highly uncertain (risky). You want risky assets to have a short payback time to minimize this risk. For CCS, we will have to wait until we get a meaningful CO2 price. Technically, CCS simply does what the oil and gas industry has been doing for decades, only in reverse. With a reasonable CO2 price, I cannot see serious issues if CO2 pipelines taking CO2 back to the gas reservoir are installed next to natural gas pipelines taking gas from the gas reservoir. Schalk, in the UK no one will build nuclear without a long- term secure CFD to cover market price risk. New nuclear capacity is being built to replace retiring nuke capacity. Offshore wind development is being managed through an auction process which will control the balance of offshore wind and nuclear capacity so should avoid detrimental curtailment of new nuclear capacity. Without these interventions new nuclear would be too risky. One shouldn’t assume, “If the combined output of wind, solar and nuclear exceeds total demand, nuclear plants will have to ramp down”. 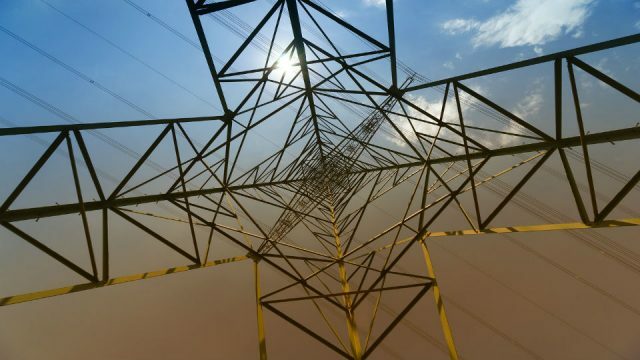 In the UK a proportion of wind generation is ‘flexible’ which means it provides Grid with services to manage the grid system so can be curtailed during the summer. Whereas existing nuclear is considered inflexible so would not be curtailed during periods of low summer demand. But even with all these advantages for french nuclear, cour de comptes calculates 65 €/MWh as neccesary average wholesale market price to keep the plants open. France did export power at 37,5€/MWh on the direct links to germany, and for 34€/MWh via Luxemburg (comming mainly from Cattenom, Luxemburg has practically no generation on its own) So too cheap to keep the plants open this way. So obviously french consumers have to pay the 3ct difference by power prices or taxes. Ad this not for new equipment, but just to keep old equimpent running a bit longer. This does not look like a working business case. With France’s domestic power prices at 15 EuroCents/kWh compared to Germany at 30 EuroCents/kWh, I doubt France is concerned. Anyway spilling surplus nuclear power which is produced at near zero marginal cost is unlikely to have much impact on EDF.